For the family who wants to rough it, there’s camping. For the family who wants the five-star treatment, there are, well, five-star hotels. But, for the family who wants to be able to have a little of both, with the sea right outside the doorstep of a modest and elegant home, there is the Koleliba traveling vacation home. Hristina Hristova designed this tiny travel trailer to be a comfy, cozy getaway from the hustle and bustle of city life, where vacationers can enjoy nature uninterrupted. Click through the gallery to see the sleek, simple interior. Hristova describes her inspiration for this portable marvel: “Our limited budget as a young family kept the idea of buying a plot and building on it distant and impossible. And by doing so we were just going to be part of the concrete army invading the sea side. 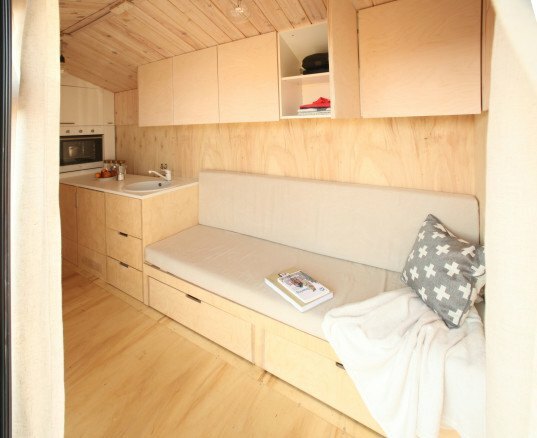 So we opted for making our retreat on wheels.” The white oiled wooden walls are bright and cherry in this 96 square foot home, with some exterior walls painted white to reflect outdoor lighting at night. Unlike traditional campers or trailers, the outdoor area is just as much a focal point as the charming interior. Keeping with Bulgarian traditions, nights including “long dinners with sea food and light music” are introduced by sipping chilled wine and enjoying fresh air with friends under the canopy. A continuation of the cozy patio, there is a convertible couch set right in front of the full-glass doors, allowing for easy entertainment. The Koleliba home – a fabricated word meaning a hut with wheels – serves as a stylish protest to expanding consumerism and the idea that more is more. By bringing families back to basic, tiny homes are shifting the focus away from materialism and back to the significance of reconnecting with one another. The white oiled wooden walls are bright and cheery in this 96 square foot home, with some exterior walls painted white to reflect outdoor lighting at night. Unlike traditional campers or trailers, the outdoor area is just as much a focal point as the charming interior. Keeping with Bulgarian traditions, nights including “long dinners with sea food and light music” are introduced by sipping chilled wine and enjoying fresh air with friends under the canopy. A continuation of the cozy patio, there is a convertible couch set right in front of the full-glass doors, allowing for easy entertainment. The Koleliba home - a fabricated word meaning a hut with wheels - serves as a stylish protest to expanding consumerism and the idea that more is more. 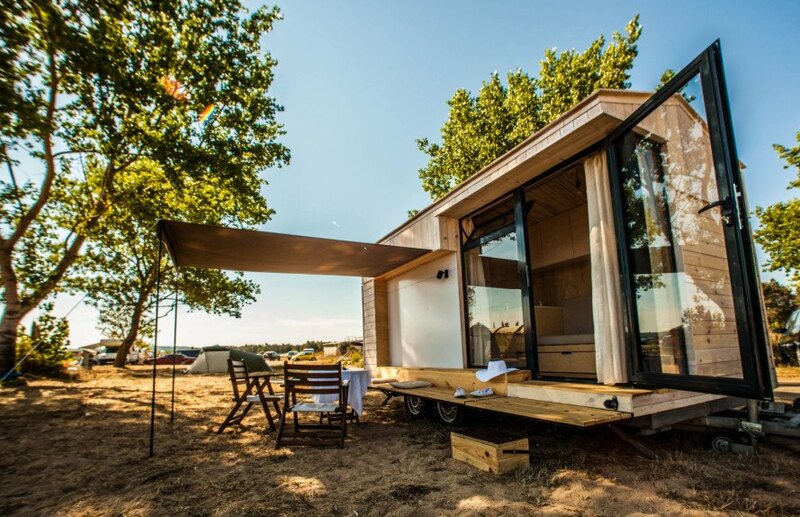 By bringing families back to basic, tiny homes are shifting the focus away from materialism and back to the significance of reconnecting with one another.